Intensive deodorant foot cream with long-lasting protection. 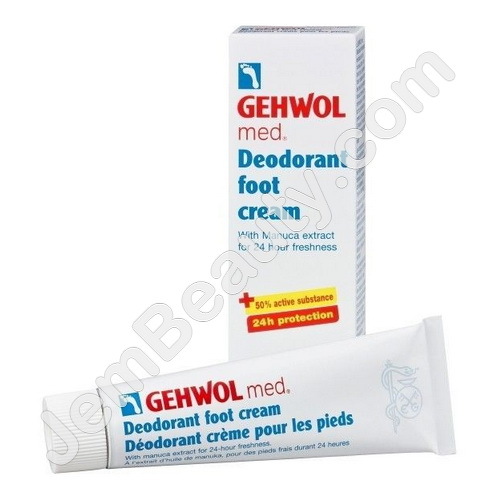 Gehwol Med Deodorant Foot Cream is based on calring jojoba oil and aloe vera and contains a new, highly effective combination of manuka oil and active zinc oxides for the long-lasting elimination of strong foot odour. Manuka oil with its tart scent is skin-friendly and has a broad-spectrum efficacy against bacteria and fungi. It is particularly suitable for foot hygiene. Zinc oxide is an excellent and well-tried ingredient with antimicrobial and skin-protecting properties in the care of sensitive skin. Aloe vera has a bacteriostatic, anti-inflammatory, regenerating, and moistening effect. Natural jojoba oil contains valuable unsaturated fatty acids, is absorbed quickly by the skin and supports important skin functions. Regular use of the mildly moisturising cream gives you odourless feet, protection against fungi, and smoothens your skin.